If confirmed by the Senate to run U.S. Space Command, Raymond would be dual-hatted and retain the title of Air Force Space Commander. WASHINGTON — President Trump on Tuesday nominated Air Force Gen. John W. “Jay” Raymond to be the commander of U.S. Space Command, a new unified combatant command that will focus on space operations and war doctrine. Raymond has been at the helm of Air Force Space Command since October 2016. Previously he was deputy chief of staff for operations for the U.S. Air Force. He has served in the Air Force for more than 34 years. The Defense Department currently has 10 combatant commands, each with a geographic or functional mission. U.S. Space Command would become the 11th. The United States had a Space Command from 1985 until 2002. It was disestablished and its functions were absorbed by U.S. Strategic Command during the George W. Bush administration to free up resources to create U.S. Northern Command to oversee homeland defense. While not all DoD leaders have been in favor of standing up a Space Force as a separate military branch, officials have been unanimously for the re-establishment of U.S. Space Command as the United States faces growing competition from China and Russia for space dominance. “U.S. Space Command will allow us to accelerate our space capabilities to defend our national interests and deter our adversaries,” Acting Defense Secretary Patrick Shanahan said on Twitter. The Pentagon requested $83.4 million in the fiscal year 2020 budget proposal to stand up U.S. Space Command. Initially it would be formed with about 600 personnel spread across four locations: Shriever Air Force Base and Peterson Air Force, in Colorado; Vandenberg Air Force Base, California; and Offutt Air Force Base, Nebraska, home of U.S. Strategic Command. The definitive location of U.S. Space Command has not yet been decided. One of the proposed locations is Shriever Air Force Base. Lawmakers have urged DoD to consider basing the new command in Florida or Texas. 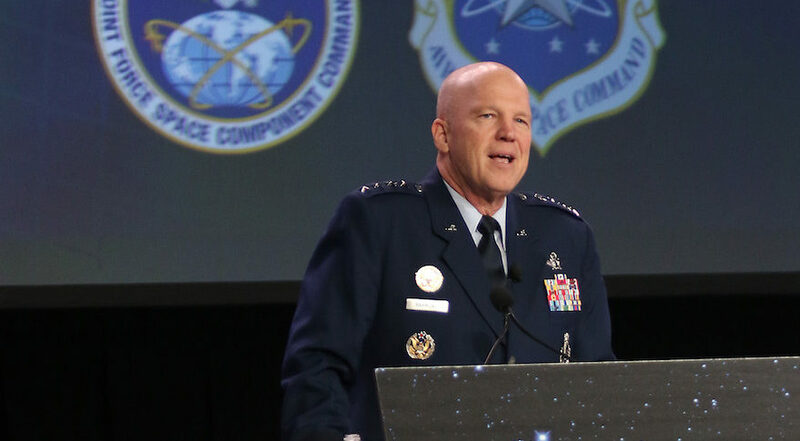 Raymond today is the nation’s top space commander, overseeing the equipping, training and organizing of space forces under the Air Force and joint forces under U.S. Space Command. The functions of U.S. Space Command currently reside in U.S. Strategic Command under a Joint Force Space Component Command, which Raymond runs. Congress in the 2018 National Defense Authorization Act extended Raymond’s term from four to six years in a bid to strengthen his role in national security space policy and procurements. Raymond has been a longtime critic of the Pentagon’s procurement process. He has spoken about the slow process of acquiring space systems as a hindrance as Chinese and Russian develop anti-satellite weapons that could be aimed at U.S. spacecraft. He has advocated for making U.S. space systems more resilient to attacks. At the Air Force Association’s annual symposium last year, Raymond said U.S. space forces have reached a “strategic inflection point” because enemies are trying to challenge U.S. access to space and possibly deny the United States use of its satellites. “We used to operate in a benign domain,” said Raymond. “Now we are operating in a contested domain.” He has advocated for increased partnering with commercial companies as one way to more quickly modernize space capabilities. Before Raymond can assume command, he has to be confirmed by the Senate, and there is another legislative hurdle to be cleared: Congress has to revoke language in the 2019 NDAA that directs DoD to establish U.S. Space Command as a “sub-unified” command under U.S. Strategic Command. That means Congress has to change the law before DoD can officially stand up U.S. Space Command as a unified command. According to DoD sources, the process would take several weeks.